The Canon EF-S 15-85mm f/3.5-5.6 IS USM Lens delivers top-tier image quality over an excellent general purpose focal length range in a nicely-sized/weighted/built body with great AF and an excellent implementation of Image Stabilization at a for-what-you-get great price. I'm impressed. Yes, there are lenses with longer focal length ranges, but few go as wide as 15mm and they usually offer compromises - typically where it hurts the most - image quality. And image quality is one area where this lens delivers. This is not a Canon L Series Lens (as of the date of this review, Canon has not released an EF-S L lens), but the 15-85 IS has many L lens qualities including three aspherical elements and one UD glass element. The above photo was shot with a Canon EOS 7D. The small image below it is a CA-corrected 100% crop from the absolute lower left corner from that image. While it does not look like a center-of-the-frame crop and shows a little typical wide angle corner distortion, it looks great compared to most similar lenses. 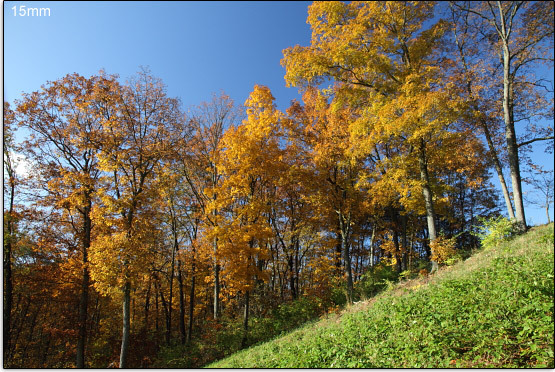 The most noticeable change in image quality when stopping down is the reduced vignetting. There is just enough light falloff to be noticed (about 1 stop) in the corners at wide open apertures over the entire focal length range. Slightly more vignetting is visible at 85mm (about 1.5 stops in the corners) and the most vignetting is present at 15mm where about 2.5 stops of light is lost in the corners. Stopping the lens down one stop eliminates most of the vignetting, but 15mm likes f/8 even better. Distortion is not a 15-85 IS (shown mounted on a Canon EOS 7D above) strength area. Most zoom lenses have some distortion present and the wider angle and longer focal length range zoom lenses tend to have the most distortion. The 15-85 has rather strong bulge-in-the-middle distortion at 15mm that neutralizes around 20mm. By 24mm, moderate pincushion distortion sets in. The moderate pincushion distortion slowly improves to slight pincushion at 70mm through 85mm. CA (Chromatic Aberration) is another area of weakness at the focal length extremes. The 15-85 shows mild CA in the corners at 15mm. By 24mm, the CA is barely noticeable until again showing in corners at 70mm. CA, simply put, is noticeable at 85mm where it is even slightly visible at mid-frame. The ISO 12233 chart results show this, but below is a specific example (the chart is only black and white). CA is one of the easier negative lens characteristics to correct. Above is a worst-case scenario for the 15-85 IS - an 85mm corner. The CA Removed example shows the correction as performed by simply selecting a checkbox in DPP (Digital Photo Pro). I also adjusted the setting amount from 100 to 94. The Neutral Picture Style with a sharpness = 2 (low) was used for this example. While not completely flare-free, the 15-85 IS is one of the better performers in its class in this regard. With the sun in the top-left corner of the frame, flare is most noticeable in the lower right corner of the frame at 15mm through 24mm. 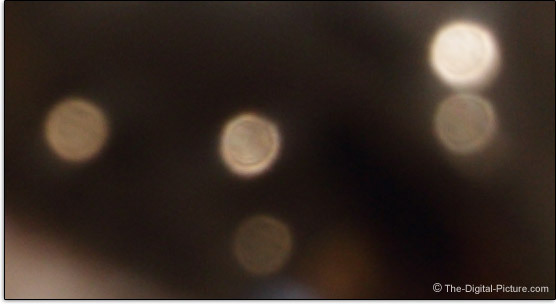 By 35mm, flare is reduced significantly - primarily isolated in the very bottom right corner of the frame. I'll provide a link to a flare comparison later in this review. Bokeh (foreground/background blur quality) is very good - especially good for its class. Stopped down OOF (Out of Focus) highlights show some concentric circles. The bokeh example below was cropped from a 15mm shot, but is similar to what is seen over the entire focal length range. Overall, image quality from this lens is very good. 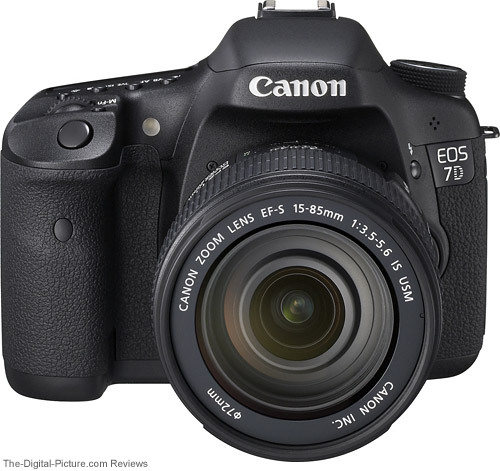 It is nearly equal to that from the Canon EF-S 17-55mm f/2.8 IS USM Lens - an impressive and best-selling lens. Camera motion blur is a great way to erase otherwise great image quality. Welcome Image Stabilization. The rule of thumb I use for determining the longest shutter speed I use to handhold a lens is 1/(focal length x FOVCF). Thus, I typically need a shutter speed of 1/(15 x 1.6) = 1/24 which is close enough to call 1/25. Specific testing with this lens at 15mm revealed that I indeed needed 1/25 for a good keeper rate with IS switched off. No surprise there. I bettered my rule of thumb slightly at 85mm with a good IS-off rate at 1/80. Turn on IS on and my acceptable keeper rate shutter speed slows all the way down to .8 and 1/5 sec at 15mm and 85mm respectively. That is 4 1/3 stops of improvement at 15mm and 4 stops at 85mm. Canon's 4-stop rating proves out for me. The above Canon EF-S 15-85mm f/3.5-5.6 IS USM Lens image was captured handheld (in a crouched position) with the Canon EOS 7D. The exposure duration was a full 1 second (15mm, f/5.6, ISO 200, RAW --> Standard Picture Style, Sharpness = "2" Low). Look past the long exposure and shadow noise and I think it looks great. I have some sharp shots at 1 1/3 second. Impressive. This implementation of IS is very quiet (not easy to hear operating even with your ear next to the lens) and is very well-behaved (image does not bounce into stabilization). Auto-panning is featured - the lens figures out when you are panning with a moving subject and adjusts motion correction for this. Remember: Just because you can shoot at these long shutter speeds doesn't mean you should. IS does not keep your subject still. People move. The wind blows. But overall, I find IS extremely useful for those times when I do not want or cannot have a tripod with me. I mentioned in another recent review that I am often found running mountain ridge-tops to get as many shots as possible during the short period of early or late-day sweet light. This often elevates my heart rate which makes it more difficult to hold the camera steady. And, running with a camera is hard enough - a tripod is not an option. The still viewfinder is really nice even without the elevated heart rate - it makes getting perfect framing easier and instills confidence that the shot will be sharp. Another component of a good image quality is proper focus. 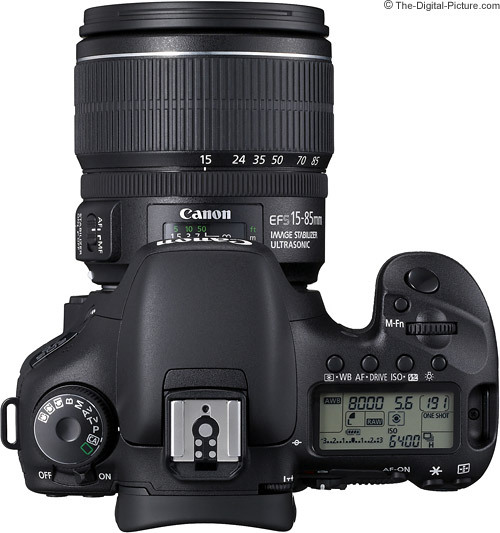 The 15-85 IS features Canon's excellent Ring USM (Ultrasonic Motor) AF system - it is the best available at review time. It is fast, accurate and quiet - and internal. AI Servo AF performs well - and more specifically, well on the cantering horses and kids on bikes I was shooting with it. FTM (Full Time Manual) focusing is provided. The MF focus ring is narrow but very smooth with no play. One of the aspects of the better EF-S lenses that I've grown to dislike is the rear-positioned focusing ring. This is where I grasp the camera with my left hand - and, although I haven't had much trouble because of it, it is possible (with FTM focusing) to inadvertently change the AF-acquired focus distance with this hold. 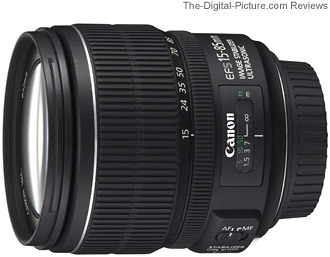 The Canon EF-S 15-85mm f/3.5-5.6 IS USM Lens extends with zoom. All lenses in this focal length range do. You can see this by using the compare link above or - here is a link to a Canon EF-S 15-85mm / 17-85mm / 17-55mm IS USM Lens Comparison. 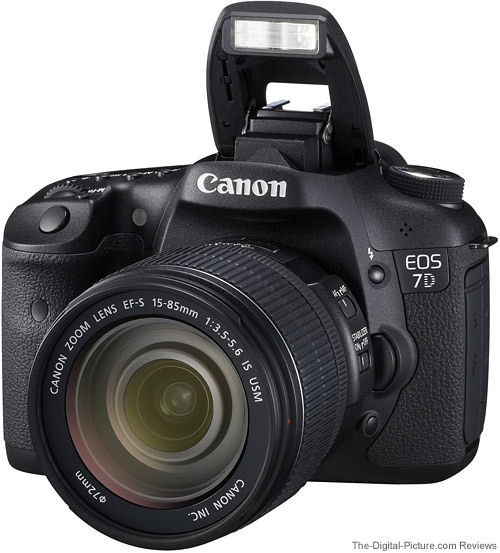 Note the newly-textured Canon EW-78E lens hood (optional). Canon's smooth, shiny hoods have long been scratch and fingerprint magnets. Keeping them looking pristine is near impossible for any lens that gets much use. This finish is definitely more scratch resistant - or scratch hiding at least - than the older smooth/semi-gloss finish. It looks better - I like it. I also like the slight additional contouring this lens hood has received. The 15-85 IS is made of quality plastic. The inner barrel extension is solid (no wobble) and the entire lens feels well-built. The generously-sized zoom ring is smooth with very little play and is sufficiently stiff to resist gravity zoom extension. The zoom ring stands out from the lens barrel/focus ring a small amount - making it very easy to find. The entire lens is a nice size/weight for carrying and handling, helping to make the 15-85 IS a great carry-around lens. The lens does not get lost on the camera but is not a burden to have with you either. 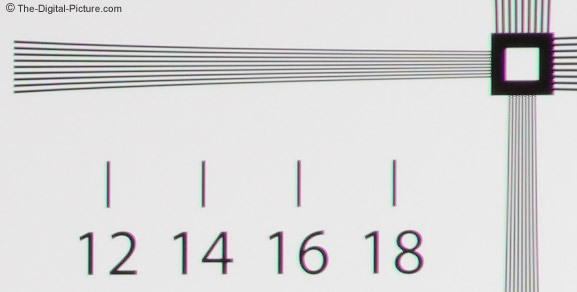 The 15-85 IS turns in a mediocre MM (Maximum Magnification) number value of .21x. This number too is in line with the comparable lenses - it does not stand out in either direction - not great, not bad. The 15-85 IS is not a fast lens and has a variable maximum aperture. Here is how the max aperture step-down goes: from 15-17mm = f/3.5, 18-26mm = f/4.0, 27-37mm = f/4.5, 38-60mm = f/5.0 and from 61-85mm = f/5.6. Use the Lens Specifications and Measurements Comparison Tool to see how these apertures compare to your lens or another lens you are considering. Basically, with IS, the 15-85 is a great low light lens for motionless subjects, but needs a good amount of light for stopping action. When I saw how good the 15-85 IS's image quality was, I knew a big outdoor comparison test was needed. Outdoor comparisons require absolutely clear skies as any clouds present influence the lighting which effects the results. Problem is, "October was wettest on record in USA" (USA Today) (and the local county received the worst soaking of any county in the state). Wet means clouds and October was of course the month this review was started. After having rain for about 28 out of 32 days, a break came - but only for a couple of hours. I cleared the schedule and quickly fit in comparison test. The separate pages (each about 13MB or so) for comparisons will also allow this review to load faster. The lenses directly compared in this test include the excellent Canon EF-S 17-55mm f/2.8 IS USM Lens, Canon EF-S 17-85mm f/4-5.6 IS USM Lens, Canon EF-S 18-55mm f/3.5-5.6 IS Lens and Canon EF-S 18-200mm f/3.5-5.6 IS Lens. 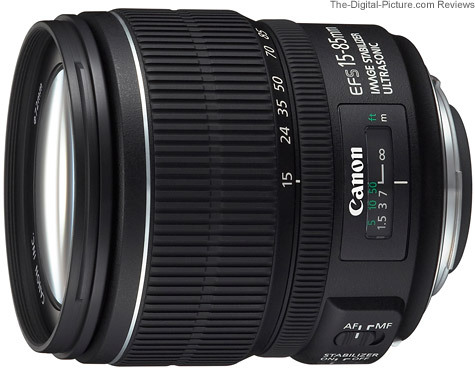 The 15-85 IS and Canon EF-S 17-55mm f/2.8 IS USM Lens cleanly win the overall competition. And at equal apertures and focal lengths, these lenses perform very similarly. 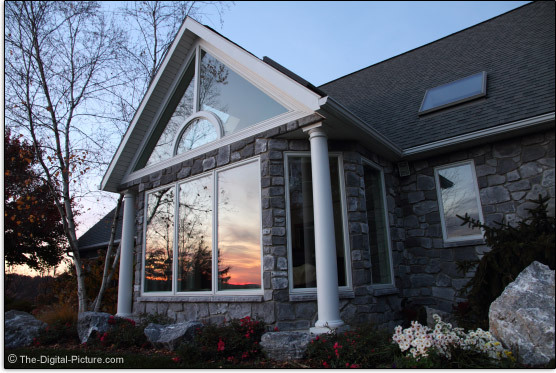 If a bright light (such as the sun) is in or near the framed image, the 17-55's image quality quickly falls apart due to flare. The 17-55 has the big aperture advantage - making it a much better low light action lens. 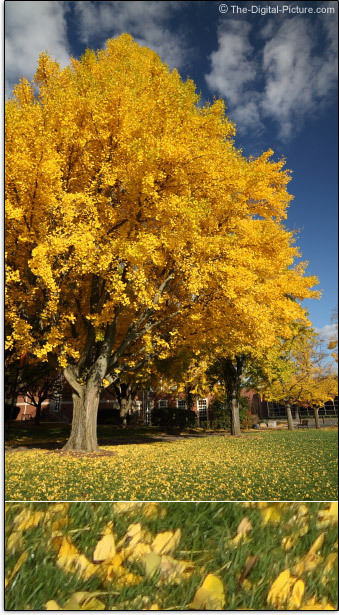 It can also create a more-strongly blurred background at the same focal lengths. The 15-85's big advantage is the longer focal length range - which extends both wider and significantly longer. The longer end advantage is very useful for portraits where the 85 works much better for tight portraits. Price is another of the 15-85's strong advantages. While the 15-85 IS and the Canon EF-S 17-85mm f/4-5.6 IS USM Lens seem similar in specs and even appearance, the 15-85 is a significant upgrade in image quality. The 15-85 has a usefully wider focal length/angle of view available. The 17-85's advantage at review time is price. The EF-S 17-85 has been one of my more-frequently recommended lenses. I've felt it was a good value with good features and decent image quality for the price. A new lens coming to market does not make an old lens perform any differently than it did before. The 17-85 is still a decent lens. But, I highly recommend the 15-85 IS over the 17-85. 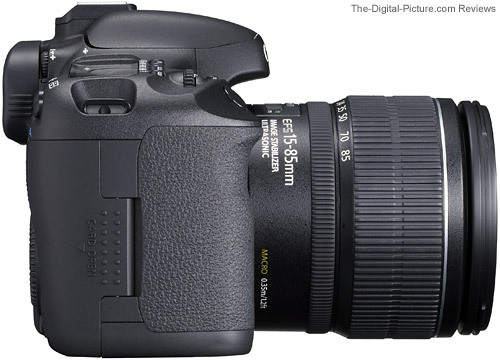 The Canon EF-S 18-55mm f/3.5-5.6 IS Lens, when purchased in a kit with Canon EOS DSLR, is a good value. The incremental cost of this lens is low and the image quality is not bad. However, when compared to the better lenses such as the EF-S 15-85 and EF-S 17-55, what is lacking in image quality becomes more clear. A primary reason you bought (or are buying) a DSLR is for great image quality - I recommend buying a better lens if your budget will allow. More specifically, I recommend buying the EF-S 15-85 or the EF-S 17-55. If your budget does not allow for a better lens right now, get started with the EF-S 18-55 IS and create your upgrade plan. The really big advantage held by the Canon EF-S 18-200mm f/3.5-5.6 IS Lens over all the other lenses in this comparison is the focal length range that comes built-in. The 15mm and 17mm to-something lenses have slightly wider angles available, but the 200mm end is simply really nice to have in the same lens. Super-zooms generally compromise image quality to some degree to gain their range. 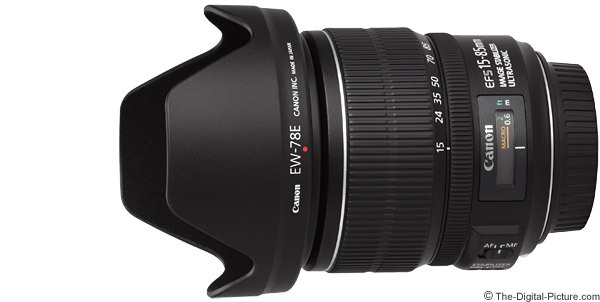 While I like the EF-S 18-200 and would prefer to have this lens over the EF-S 18-55 IS kit lens, the EF-S 15-85 and EF-S 17-55 offer better image quality along with excellent Ring USM AF. The general purpose lens field is a crowded one, but the Canon EF-S 15-85mm f/3.5-5.6 IS USM Lens stands out from that crowd by, as I said at the beginning of this review, offering top-tier image quality over an excellent general purpose focal length range in a nicely-sized/weighted/built body with great AF and an excellent implementation of Image Stabilization at a for-what-you-get great price. This is not a cheap lens, but I think it is a great value for what you get. The Canon EF-S 15-85mm f/3.5-5.6 IS USM Lens is a great leave-on-the-camera lens - It is going to share this role with my 17-55.